LAFAYETTE, Ind. — Area IV Agency on Aging and Community Action Programs will host their 25th Anniversary Senior Games during the week of June 6 – 10, 2011. 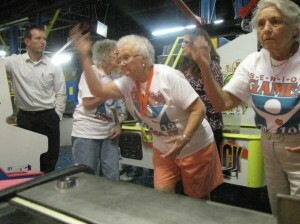 The annual Senior Games feature a variety of recreational activities ranging from track and field, golf, swimming and horseshoes to a nature walk, bocce ball, billiards and even line dancing, skee ball, BINGO and euchre — 22 events in all, including mountain biking (which is new this year), and a weekend event to kick off the Games. On Saturday, June 4th beginning at 10:00a, all softball players and their fans are invited to the Arni Cohen Fields in West Lafayette for the 1st Annual Area IV Senior Softball Tournament. Teams will be organized that morning. Arni’s refreshments will be served; door prizes will be given away and 25th Anniversary t-shirts will be available for sale. Senior Games are for everyone age 55 and over from Benton, Carroll, Clinton, Fountain, Montgomery, Tippecanoe, Warren and White Counties regardless of level of ability. Torch Captain Patrick Harding of West Lafayette will light the torch on Opening Day (June 6th) at Tecumseh Junior High School and then extinguish it on Friday the 10th at the Trails Banquet Facility during the Closing Ceremony where guests will be entertained by Comedian Kay Frances of Ohio, “America’s Funniest Stressbuster”. This year, all past Torch Captains are invited to join in the lighting and be recognized once again for their outstanding contributions during the past 25 years. Senior Games offers participants the opportunity to compete and win medals while staying active, having fun and enjoying the company of the other participants. Registration is now open and will continue through May 31st. Those who participated in 2010 will automatically receive a registration form for 2011 Senior Games by mail. Forms are also available online at www.areaivagency.org. All participants will receive the commemorative 25th Anniversary t-shirt. FREE Transportation is available to many Senor Games events (all regular routes) through CityBus for those individuals 65 and older. For more information or to schedule a presentation for your group or organization, call the Senior Games hotline at (765)447-7683 or (800)382-7556.